The idea of Albatros Publishing House to publish a unique pictorial book, and the wish of Jan William Drnek to document the great Czech works met at the right moment – in autumn 2016. Panoramic photographing of all twenty images of The Slav Epic was carried out at the Trade Fair Palace in Prague in December 2016 shortly before the canvas was due to be prepared for travel to Japan. The team, headed by the energetic Drnek, worked for a month; during the night, and on Mondays when the National Gallery was closed. The intensive work of Jan William Drnek was attended by members of his family – Jan’s daughter, who composed panoramas and created quick previews during the shootings. Jan’s son, a filmmaker and experienced lighting technician, as well as Jan’s wife, were of great support throughout the work. 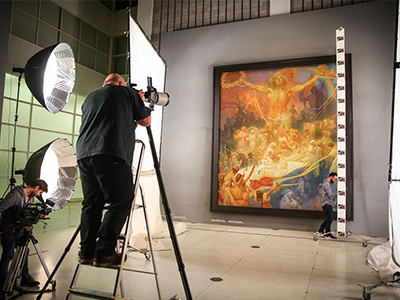 Capturing images of such large canvases would not have been possible without the technology and quality of illumination, as well as the presence of The Slav Epic restorer; Thomas Berger. The photography was preceded by thorough preparation, measurement, computation and mathematical modelling. The shoot itself only took a few minutes for each image. To capture images of such large canvas (the largest ones being 610 x 810cm), a great distance was needed, but for some images this could only be 9 meters. However, thanks to the high quality technique and the optimal combination of focal length, aperture and diffraction parameters, the result wouldn’t suggest this. The images of The Slav Epic occupy an area of 650 m2, and more than 10,000 images of 50mb each were created during its digitisation. Digitising one large format image required approximately 300 photos to be compiled into a single unit of about 60 GB in postproduction. Jan William Drnek made ten versions of them, of which he chose the best for the book. The Slav Epic was the dream of the painter Alfons Maria Mucha. The digitisation of this magnificent work fulfilled the dream of photographer Jan William Drnk. It is a completely faithful reproduction that not only preserves a cultural monument but also revives it 90 years on. Thanks to the whole project, The Slav Epic comes back into the hands of a nation that now has the chance to finally accept it and understand it.